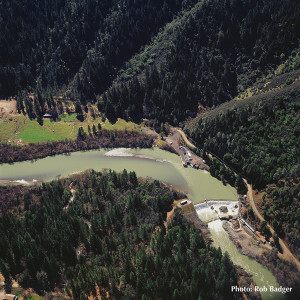 Click here or scroll down to see the latest news about the Eel River Dams. Help us work toward dam removal, sign up for our mailing list to get involved. The Potter Valley Project is a small hydropower project in the headwaters of the Eel River. It consists of two dams, a mile-long diversion tunnel, and a powerhouse with a 9.4 mw capacity. 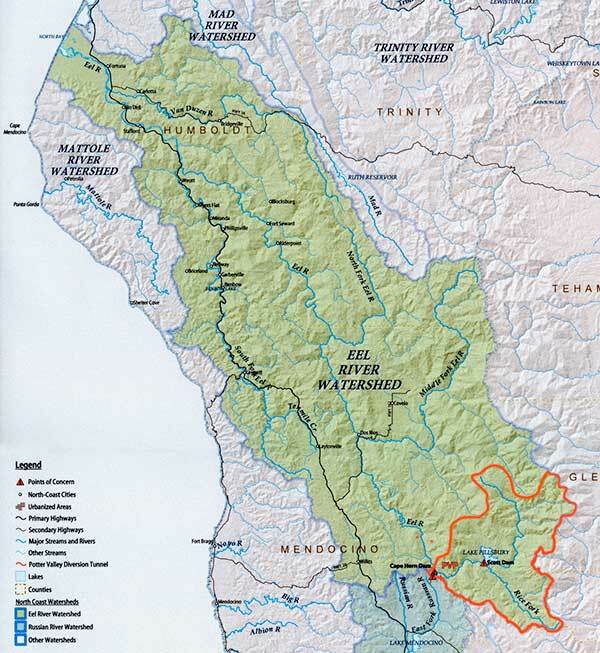 The project is located in the Eel River headwaters and diverts water out of the watershed into the Russian River. Removing this project is the necessary first step to fisheries recovery on the Eel River. Learn more about dam impacts to fisheries habitat & flow, local economy, energy production, and downstream safety here. Traveling upriver as the salmon do, Cape Horn Dam is the first structure. It was built in 1908, stands 96ft tall, and impounds the river to make the 700af Van Arsdale Reservoir. Cape Horn Dam is equipped with a fish ladder, although some migrating species like Lamprey still have a hard time with this obstacle. About 12 miles upstream is Scott Dam. It was built in 1922, stands 138ft tall, and creates the roughly 79,000af Lake Pillsbury Reservoir. Scott Dam lacks any fish passage, preventing migrating salmonids and other native species from accessing roughly 10% of the Eel River Watershed. Scott Dam impounds the river to form Lake Pillsbury Reservoir, all under the backdrop of Snow Mountain. Cape Horn Dam impounds the Eel River to form Van Arsdale Reservoir. There is a fish ladder here where the Department of Fish and Wildlife conducts fish counts. Click here for information about the Potter Valley Project re-licensing process, and how to get involved to support decommissioning and removal. Click here for our Potter Valley Project article archive. Click here to learn about FERC, the agency responsible for regulating hydropower projects. 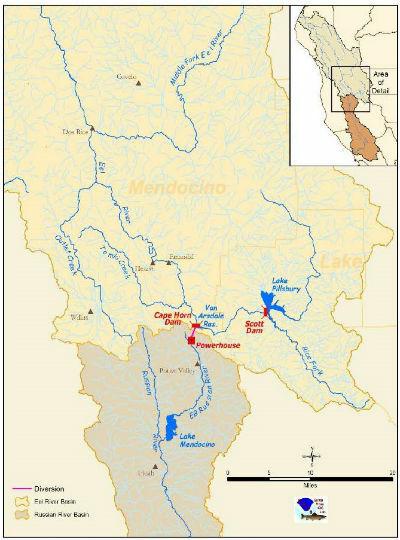 Click here to learn about the Sonoma County Water Agency and their management of Eel River water flowing in the Russian River. Learn about dam removal and why it is often a necessary step on the path to restoring rivers and native fish runs.